Phoenix Labs, a studio made up of veterans from BioWare, Riot Games, Capcom and Blizzard showed off their debut release tonight at The Game Awards 2016, an online co-op action RPG called Dauntless. For more news from The Game Awards 2016, hit up the PCgamesN homepage. Dauntless takes players to a sci-fi fantasy land called the Shattered Isles, where massive creatures called Behemoths are a constant threat in a world where humanity is forced to live on floating islands after an apocalyptic event tore the land apart. You play as a Slayer, sworn to protect mankind from these massive monsters, and you can either take them down on your own or team up for some four-player beast slaying. The developers say you’ll need to forge and upgrade your weapons, and kit yourself out with the right kit for the job, if you want to succeed, as every fight will be different. It does all sound very Monster Hunter. 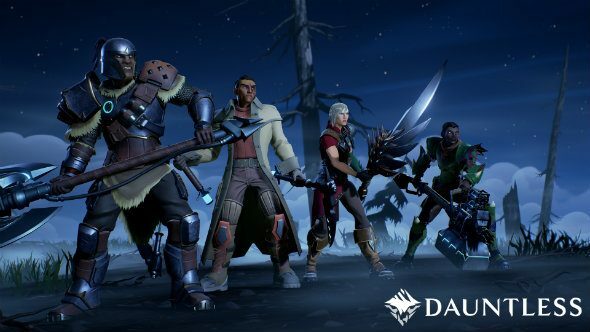 Dauntless will be free-to-play and will be updated regularly with new quests to tackle in a “vast, ever-changing frontier”. It’s releasing in 2017.